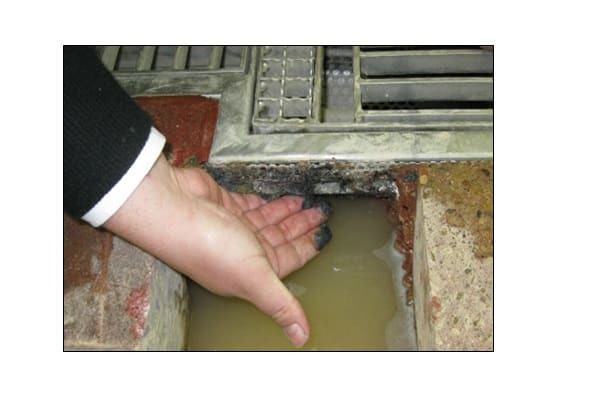 A structural failure in a grate and floor has resulted in a reservoir of heavily contaminate wastewater hosting black pathogen-ridden residues on the underside, none of which can be effectively cleaned. Floors and drains are an integral part of a food processing facility. Keeping them clean and therefore hygienic is paramount to reducing the risk of food borne pathogens. Recognising that the drain, gully and floor may need an upgrade is the first step to reducing the risks of a non-hygienic environment. ACO Australia product manager Kate Jennings explains. For food processing, floors can be exposed to water, grease and chemicals; heavy foot traffic and hard-wheeled trolleys, pallet jacks and forklifts. The temperature range a floor can experience ranges from sub zero freezers through to hot water washdown. As a consequence, drains, floors and the joints between the two elements can deteriorate and become impossible to clean. Cracks may develop in the sub-surface under the grate; the epoxy flooring may come away from the edge of the gully or stagnant water can pool in joins and crevices, all of which are potential sites for bacteria growth. We describe these scenarios as hygienic installation failures. The most common is a hygienic failure, which is where the floor installation is compromised by a visible fracture, crack or separation where microorganisms can be harboured and difficult to clean and disinfect. The other failure is a structural failure, which usually occurs after a hygienic failure event and often leads to a slip or trip hazard. In most food processing facilities, the upgrade will depend on a few factors including the risk profile of the room; whether the equipment and drainage points meet the needs of the processing being conducted and if the production flow is at its optimal level. For older installations with ageing pipework, a complete overhaul may be necessary. It might be that the pipes are damaged terracotta or concrete in which case it is an opportune time to bring the system up to current standards. For food production that has a high risk profile, such as ready to eat meals, greater consideration will need to be given to ensure the facility has optimum hygiene standards. If facility managers are looking to improve the efficiency of the production line, re-working floors and drainage layout is a good time to do so to ensure that the drains and gully points are in the right location for the equipment. We have seen an ice cream factory where linear channels near the production line did not adequately capture condensate from the freezers. Relocating the drains nearer to the freezer alleviated the problem. If during the upgrade the room is to be re-purposed or new equipment installed then it is a good opportunity to assess the overall layout of drains and equipment for optimal performance, without necessarily reworking in-ground pipework. The most common floor surface we see in food processing is epoxy, which gives facility managers better outcomes for floor hygiene. Where the floor and grate meet will always require special attention – is it correctly sealed; is the concrete surface underneath in good condition and does the grate sit flush or below the level of the floor so that water flows easily into it? The grate needs to be able to withstand the weight distribution through the wheel – forklifts have large pneumatic tyres compared to smoke oven trolleys which have small, hard wheels. The smaller the wheel the greater the load through a single point to the grate. The size of the gap in the grate – the aperture – should also be considered as small wheels have the potential to get ‘stuck’ in larger apertures. Making the decision to upgrade the grate and drain and potentially the floor is ultimately determined by the risk status of the food production undertaken. The key design points to consider are: where does the water originate from; where does it need to discharge to and does the drainage systems align with the needs of production. Once these points are resolved, upgrades can be undertaken knowing that the function of the room is at its optimum and provides a safe environment for food processing.